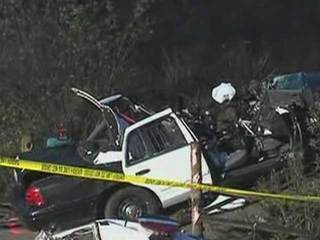 According to ECM news partner 10 News, it took 45 minutes to extricate the officer, whose injuries included broken bones. The trapped officer honked his horn to attract attention of passing motorists. 10 News reports the officer was returning from transporting a prisoner to Las Colinas Jail when he was struck by the truck, which reportedly ran a red light. The officer, who sustained serious injuries, was taken to Sharp Memorial Hospital for treatment. His identity has not been released. The driver was treated and subsequently arrested, booked into jail on suspicion of felony driving under the influence of alcohol with an injury.